Not all granola bars are created equal — some contain as much sugar as a candy bar! 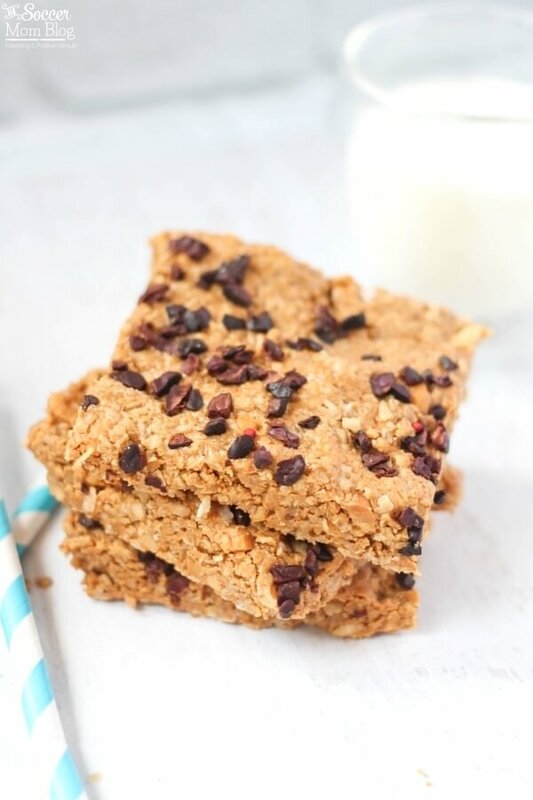 However, these healthy Peanut Butter Granola Bars are guaranteed to satisfy your sweet tooth, without all the added sugar! 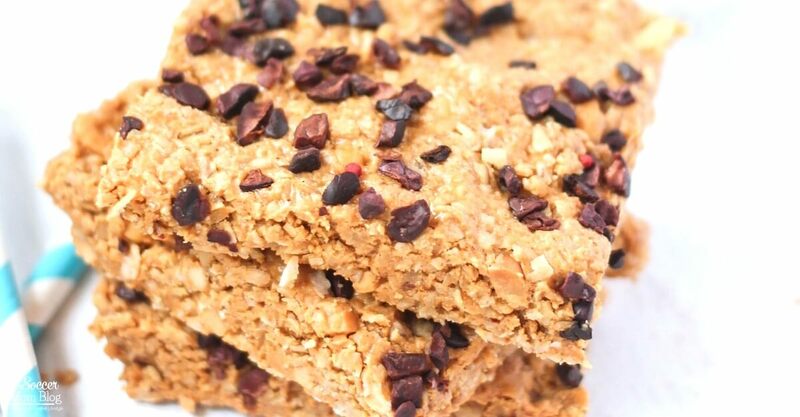 Fresh-baked “PB Bliss Bars” were one of my favorite treats when I worked at our university deli — until I found out how much sugar they contained! That’s why I recreated my own healthier version of my favorite peanut butter granola bars to enjoy guilt free. 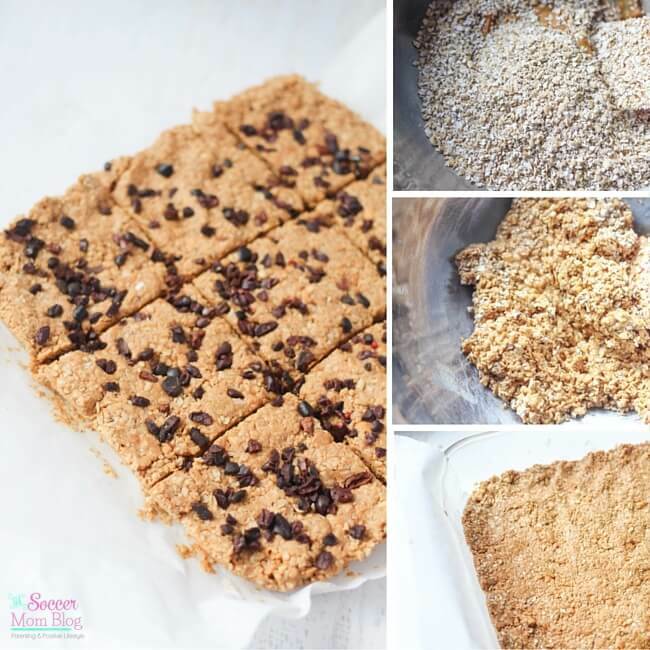 Besides all the healthy benefits, these easy granola bars are super satisfying! That crunch, the rich peanut butter flavor with a touch of sweetness, and of course, that chocolate topping totally hit the spot for me. Bonus: they’re a hit with kids too! 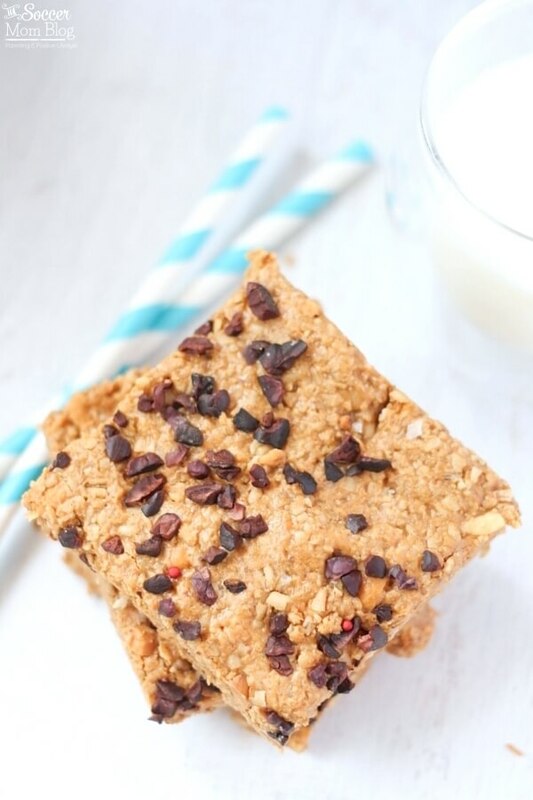 Start the day with one of these peanut butter granola bars for a quick and healthy breakfast, grab one for an on-the-go snack, or pop on in the kiddo’s lunchbox for a treat you can feel good about serving. 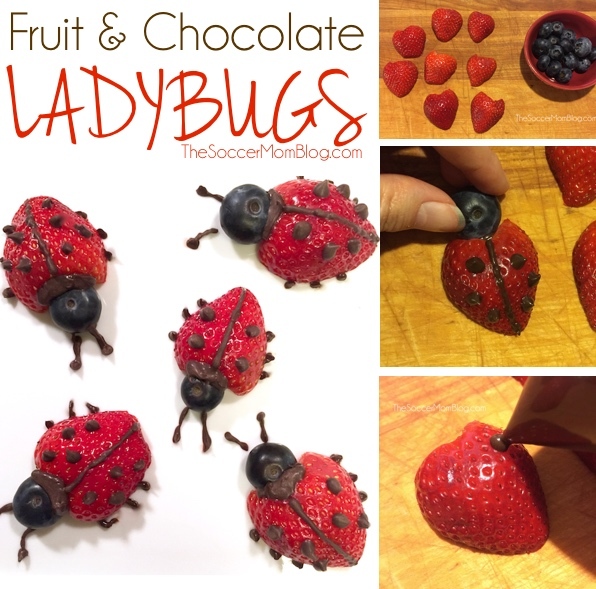 They’re perfect to make ahead for busy days! 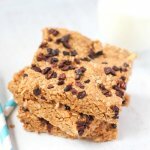 If you’re looking for a whole foods indulgence that will totally satisfy that sweet tooth… without inducing a sugar-headache, these healthy peanut butter chocolate chip granola bars are just the ticket! Love granola?? 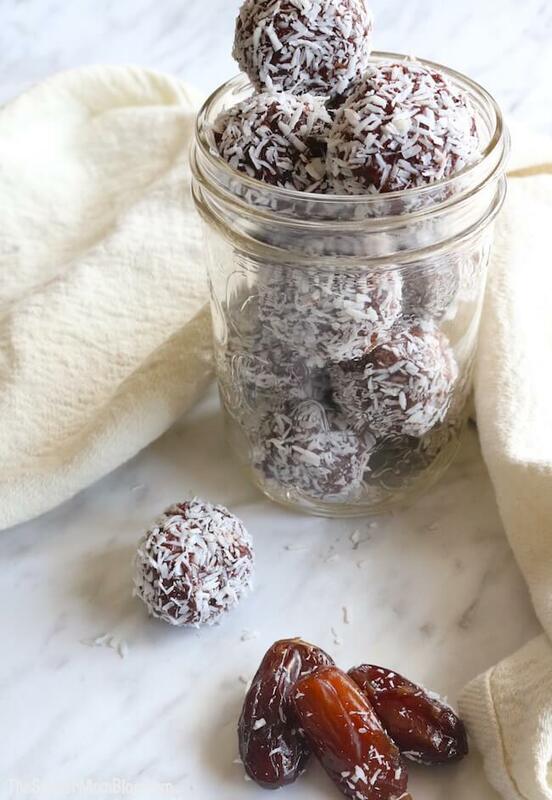 Be sure to try our Chocolate Peanut Butter Protein Balls too! Keep reading for photo step-by-step directions and cooking tips or click here to jump straight to printable recipe. Preheat oven to 325°F. 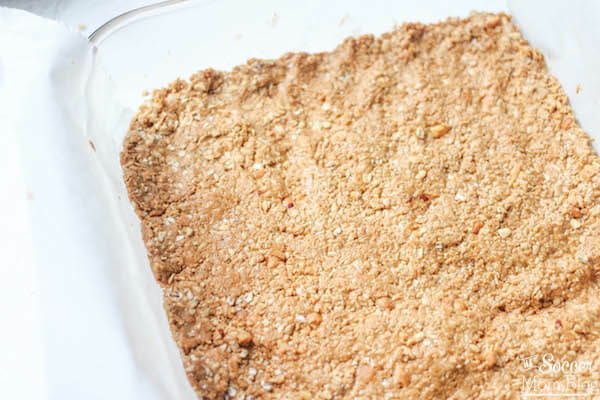 Line a baking pan with a square of parchment paper and set aside. Stir the oats, honey, cinnamon, salt and peanut butter together. Taste and adjust the sweetness or add a bit more salt to help round out the natural peanut butter. 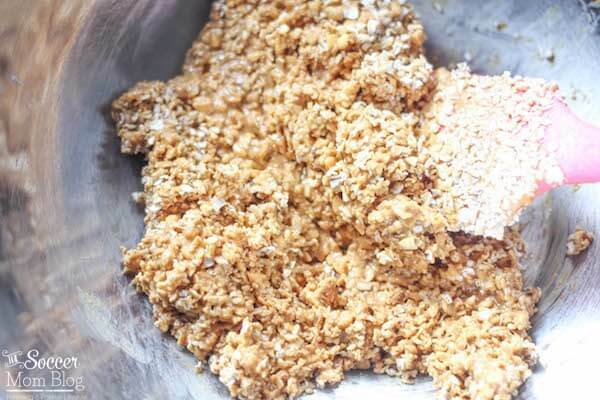 Press the oat mixture into the prepared pan, and bake for 12-15 minutes. Immediately sprinkle cocoa nibs or mini chocolate chips over top of the granola bars. Tip: Gently press chocolate chips into granola so they’ll stay in place when you cut and serve. Use caution, as the bars may still be hot. Storage Tips: Keep in an airtight container for 2-4 days or freeze to enjoy later. Press the oat mixture into the prepared pan, and bake for 12-15 minutes. 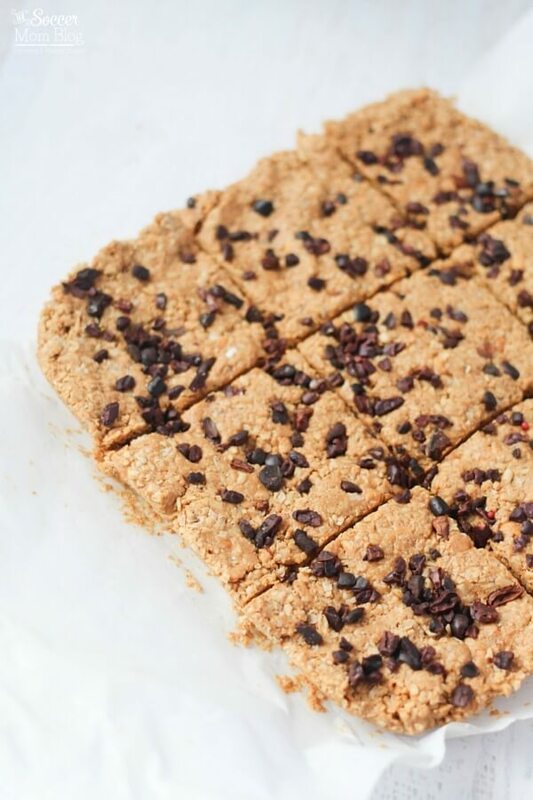 Immediately sprinkle or press the nibs or chocolate chips over top of the pb bliss bars. 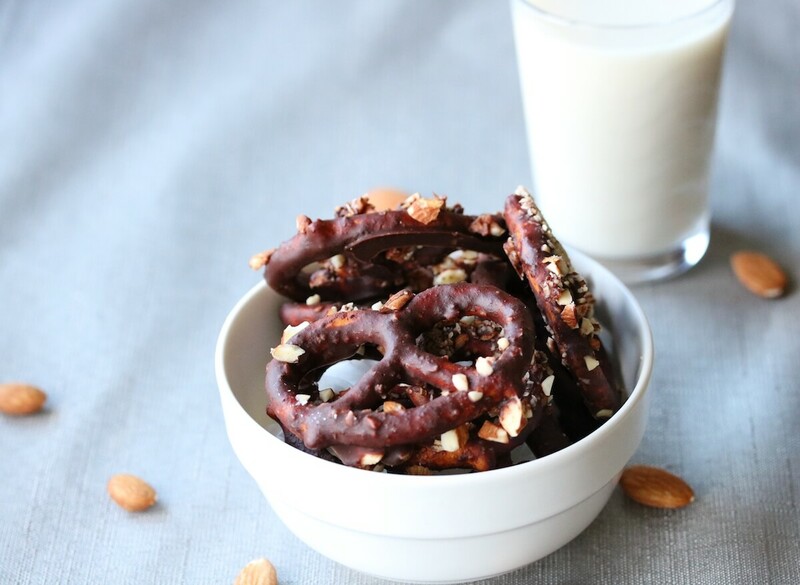 They definitely are an easy way to sneak protein into your day (and prevent that mid-morning energy crash!) Hope you love them!